I took this photo back in May. And now, here’s the story. This Albany restaurant has been closed for a number of years, but its proprietor now says he hopes to reopen it soon. Not just reopen it as a burger place, Ed Wright says. No, he intends to make it THE burger place. 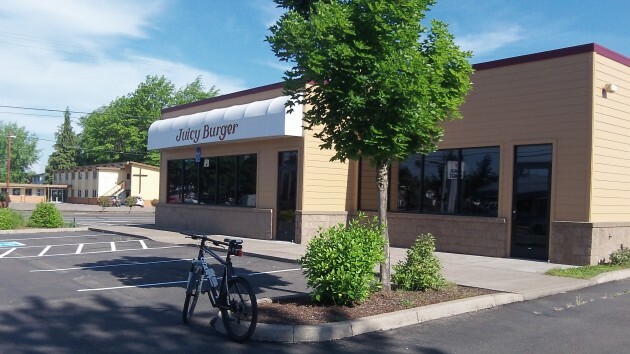 A few months ago a reader wondered what was going on with the Juicy Burger building on the southwest corner of Queen Avenue and Elm Street. It took me a while to get busy on this, but recently I talked to property owner Gordon Wallace of Corvallis, who told me that for years the building had been rented by Ed Wright. And this week I talked with Wright, who operates The Original Breakfast restaurant on Santiam Highway near I-5. Wright says that last spring he was making progress in getting the burger place in shape, but then his father fell ill and this stopped the son’s work on the new restaurant. His father recovered, but then in October Wright ran into a big problem with the leased restaurant property on Santiam. The sewer lateral had collapsed, and fixing it proved all but impossible because it ran under a neighboring property, forcing him to have wastewater pumped out for disposal every three days. He eventually built a new sewer line and abandoned the old one, but all this cost him $27,000 plus lots and lots of time. Now, Wright says, he’s ready to get back to the Juicy Burger. He hopes that in two weeks he’ll have it to the point where it could open as soon as he gets a crew together to staff it. Thanks for sharing this info! Many of us Westies we’re curious. Looking forward to another place to eat within walking distance, and a bit on the healthier side. We love supporting our local community!